Alejandro Vela sent us these images of his monorail station project. His station is a combination of various standard HO model railroad kits along with the well-known E-R HO Monorail set based on the Von Roll monorail system. 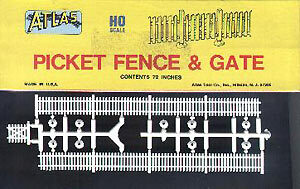 Picket fence for a monorail station? Sure, why not? The images are a bit fuzzy, but you can see that it is a clever way to make a monorail station. Thanks for sharing Alejandro!